In the spirit of keeping things simple I decide to add to what was my greatest challenge in all of 2015 - Out of Your Comfort Zone. This was the June 2015 Challenge and I made my first-ever-and-scared-to-death-to-do-it Regency gown. I wore it to Costume College that summer and even taught a class wearing the gown since I was teaching how to make ribbon flower pansies and I had decorated my hat with those flowers. 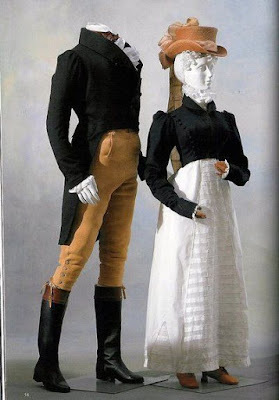 My inspiration for this Regency gown was an ensemble from the Kyoto Costume Institute. There may be a day where I will encourage my husband to join me in this era, but that day is not now. I do, however, want to create a Spencer - a short jacket. The pattern I used for the gown is a complete wardrobe and has a wonderful Spencer pattern with options for two different collars, a peplum, and oversleeves. 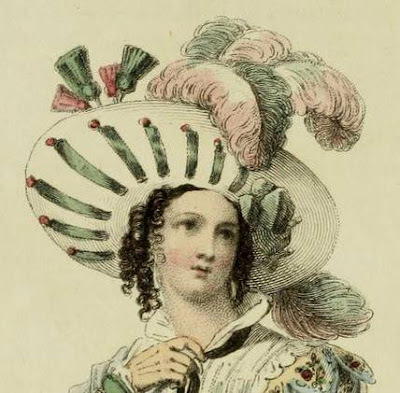 The pattern is Regency Wardrobe by La Mode Bagatelle. Being short on time and long on a stash fabric of embroidered linen that I purchased from the same costumer who sold me the white linen for the gown, I go immediately into a final sewing. All pieces and lining cut and ready. Lining for front. Notice the 3/4" shortness of the front piece? That happened with the outer layer as well and I still don't know why, but I simply tapered the lower edge into the side piece and made a note to revise if I make this pattern again. Note to self - always make a mock-up. Pieces ready for assembly onto the main body of the Spencer - lower band, peplum, collar with tassel, lined sleeves with lace and tabs. Collar ready for assembly to the main bodice. Lower band is added, peplum attached, and band lining stitched in place. Attach the sleeves, some hand finishing because there wasn't time to be historically accurate and hand sew ALL THE THING, and I have a pretty pink Spencer for my Regency gown. I really love the color and in different lighting it changes to a beautiful dusty rose color. At this point it's the holidays, work assignments, cold weather, and a determination on my part to have some wonderful photos of this ensemble being worn. When I wore the gown I was nervous as it was completely 'out of my comfort zone' as the named Challenge. Although many people saw it at Costume College I didn't receive one comment about the gown. When I finally posted it in the Challenge album there wasn't a single comment and only 9 'likes'. While still hesitating to wear, photo, and post my final Challenge for 2015 I create a two-tone feather inspired by this portrait. I clipped the feathers off each side of two different color feathers and then ladder stitched them together. It worked well and I see other multi-colored feathers in my future! My husband has graciously agreed to be a photographer for a day and I ready everything. Then it rains. While combing the stash for a fabric for my next project I spy this lonely little remnant and decide it is the perfect color for a reticule for my ensemble and the La Mode Bagatelle pattern already contains a wonderful design. So as to not lose my nerve about the photo shoot, I make up this pretty reticule. The exterior and the lining and my go-to tool for sewing points - a wooden chopstick. Thread a second ribbon completely around from the other side and knot the ends. Pull the ribbons and you have a pretty reticule to carry your cell phone. It is now March 21st, the second day of spring and the weeping willow tree in our front yard is in full bloom. It is clear and sunny but very windy and my husband and I enjoy a spring day with me in a very spring-like Regency gown and accessories. Thank you, hubby!! How historically accurate is it? Primarily machine stitched with hand finishing. First Worn: Today for photos.